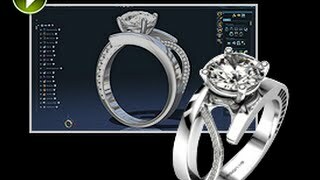 3DESIGN is the most innovative 3D Jewelry CAD Software Solution in the market and is aimed to Jewelry creators and Manufacturers, Watchmakers, Accessory Designers or Artisan Jewelers. 3DESIGN allows designing Jewelry models in 3D, present them, validate them, sell them and produce them. A historic construction tree and unique associative/parametric tecbnology on the market: easily create your pieces and ranges. Modify them at any stage, even days later, without having to restart your creation. A clear and intuitive interface: allowing fast learning of 3DESIGN CAD and the production of unique pieces in less time. Works on Mac and PC platforms. From 2D to 3D: In just a few clicks go from 2D (sketch, photo, etc) to the production of your designs in 3D. Libraries of varied objects: let your imagination run wild and create all sorts of original pieces. Bring your libraries to life, enrich them with your own creations. A library of Swarovski elements is also integrated. A 3D visualization and animation module: highlight and present your pieces thanks to photo realistic rendering. Multiple file import and export options (you can create pieces in other "mechanical" CAD software and import them in 3DESIGN to use the professional jeweling features for example). Or you can export your creation in STL or STEP/IGES (among many others) towards production. Create and customize your own stones, metals, varying weight, plating, and edit accurate cost reports. and achieve a high quality creation. 3DESIGN offers a full range of features for effective, accurate, fast and professional creation. The interface is transparent, immediate, refined, privileges the essential, improves your comfort and thus opens up a new creative horizon. Quick access toolbar(QAT): Drop the 3D modelling and jewelry workshop tools into this box so they are permanently available. A new tool palette management method allows you to organize your screen(s): pinned, floating, it's up to you. The contextual help opens up a separate window making it easier to read. Already a pioneer in realistic rendering creations, 3DESIGN takes this a step further. This real-time photo realism helps you to make accurate and clear decisions about the design of your piece and improves communication with your clients: the finished piece already on your screen! Anti-aliasing: get ready for High Definition! Customizable shadows and light sources. Parametric? What are the benefits of this technology? Thanks to the parametric technology, easily create and explore new variations to your shapes in real time and in 3D. Each step is automatically recorded within the associative construction tree. Modify one or more parameters inside the tree and 3DESIGN recomputes your entire model in a matter of seconds. Infinite retouching and changes are possible, whenever it suits you! A simple feature to solve a real dilemma: closing your rings harmoniously. Start with a finger size, a curve, run the feature and that's it! A revolution in creation! Easily wrap and unwrap a Bas-Relief or a Texture on any 2D or 3D shape. Your new favorite tool! An essential function for constructing a ring from a profile view, front view and a view of one or more sections. Ideal for rings as well as any 3D object. An incredible time saving leaving time for creation. By going to the end of the feature to obtain creation straight into 3D. By easily creating scanning rails over which you get full control on. Filigree effects, twisting, woven constructions, your needs are recurrent and very varied. Using the twisting tool, it is a motif twisted on itself or the interlinking of several threads over a curve which will be created. It's easy, obvious, addictive! From flower petals shaped by the wind, you can create a shape by working on its overall volume. You just need to create an envelope comprising more or less links which you can then move to shape your object. New modelling ideas for an even more intuitive creation! Create paving with baguettes, define your stones according to your needs or stocks, cut a notch and achieve the result you want! And if your stones will be placed alone? Simply a "must" to achieve the best result possible. Try the different strategies then perform manual retouching for a unique result! Achieve great jewelery results using multiple piercings. Adjust your parameters to achieve the ideal design for your stones. Manual resumption possible from Version 9. The creation of prongs has never been as easy and customizable. Define all the elements by starting with the section, size, shape, rotation and angle and finalize your piece using the different options available. presentation or an email, 3DESIGN offers the solution you need. 3DESIGN - Certify your expertise level as well! 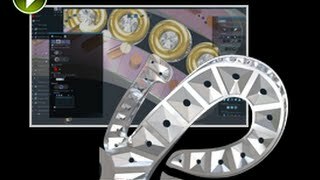 3DESIGN CAD has allowed me to come closer to the perfection that every jeweller desires. Good visualisation of my design, and accuracy while working with the design. It enables me to modify my designs until achieving the satisfied result and saving a lot of valuable time. 3DESIGN provides excellent tools, all of which help me achieve great quality designs, service and support. It is so gratifying! This technology that has lifted up a generation to a new and prosperous future. Well Done. I am so grateful that this software has come my way, to experience and heighten my prospects for success. I have identified many assets to the software: speed, userfriendliness, powerful, intuitive modules (especially the rendering module). These capabilities are absolutely necessary for me to complete my orders. 3DESIGN is my primary work tool, I cannot make a mistake choosing it. Many reasons pushed me towards new technologies but my objective was mainly to improve quality, creation time and to design entire ranges easily and more rapidly. And I did take the good decision.